In 2010 my book came out and very shortly after that, Carolyn See gave it the weirdest book review I’ve ever read. She panned it with one hand and she praised it with another; she said I seemed so kind and good and then spoke about me like I was a small, silly child who didn’t know any better than to have written the book I wrote. She went on and on about hair as though I had gone on and on about hair, but no one seemed to think that but her. She was so very, gratuitously mean. If God were to come into my head and write through my fingers, if a channel were to open up and deliver the wisdom of the universe directly into my words, I still am not certain I would be able to convey just how deeply that review hurt me. I collapsed, and no one really knows how collapsed I was. I have a big smile and a dark heart full of falsehood. I even have a blog of lies. (I wrote a blogpost then about that review, but my agent and my editor made me take it down. But Carolyn See is dead now, so I figure, what the heck. She killed my book and I’m not really over it, so I reposted the blogpost). For a long time, I was unable to read fiction. I was unable to sit at my computer. I was unable to enter my office. I was unable to take a deep breath, and I mean that literally. The whole landscape of depression was like walking on a different planet without enough air, and I did not think I was depressed and I never would even have considered getting help, because I didn’t know I was depressed. And because this inability to function was hiding behind a really big smile, and because no one else’s balls were dropped (everyone got to practices on time; everyone got to school on time, clean and with their homework; the birds didn’t die; the house stayed clean enough; I showered; I exercised) no one knew enough to tell me to get help. And when a person is in that state, but is never in that state, and so she feels like she is walking on a planet without air, but she keeps waking up and she keeps moving along and doing the things, I think sometimes God intercedes on her behalf and offers small, shallow steps to climb out. I am not kidding when I say that I knit my way out of depression. There is something deeply meditative about knitting. The needles click in your fingers, and when you’re knitting something simple, the clicks form a steady rhythm, which in a silent room is something like a heartbeat. Needles are cool and smooth, but yarn is warm and textured. I am a person who is stirred by bright colors and so there are bright colors. The fabric you create rises up out of nothing in your hands. It is lasting. I knit a sweater once in college. My roommate Ibby taught me how. She could do everything. It was white and it had a black, knit numeral 8 appliquéd on the front. It was the 1980’s and we wore things like that. Later I unraveled it and wove it into something on a loom, and I don’t even remember what happened to it after. Anyway, in the ensuing 30 years, I forgot how to knit. So I bought a little book (remember, in 2010, YouTube wasn’t the staggering source of tutorials it is today), and I bought a set of needles and I pulled out some yarn I had in the house, and I relearned how to knit. 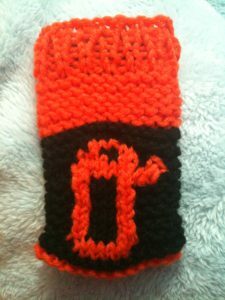 And the thing I knit was iPhone socks. 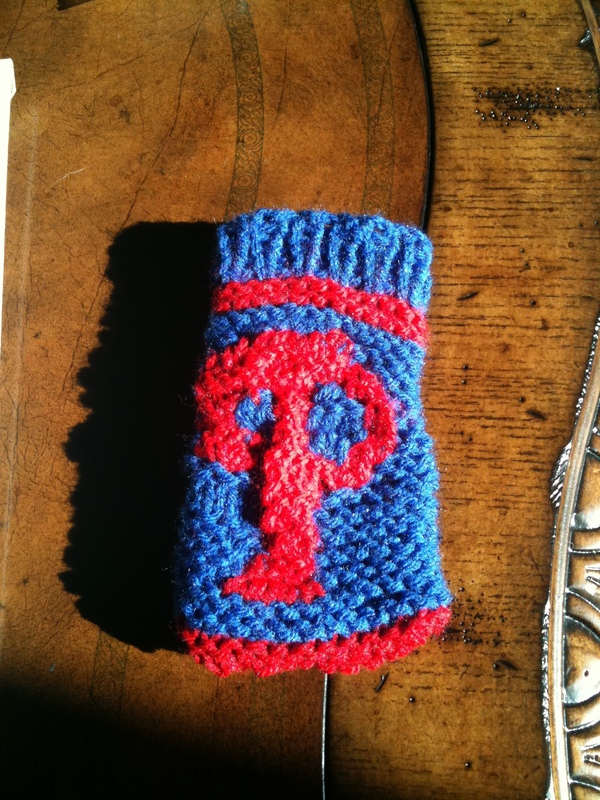 Little sleeves into which we could put our little iPhone 4’s. They were garter stitched with a little rib at the opening, and rather than appliqué-ing the letter on, I figured out how to knit the pattern into the fabric in stockinette. Noodling over how to do this also calmed and occupied my frantic mind. Steve Williams was a hero among men, a friend who would prop you up without even asking why you needed propping. Steve died without warning before I ever got to meet him in person. He was a friend of a friend, we met on Facebook, and he became such a strong supporter of mine. He bought my book. He bought multiple copies and gave them to friends. Steve was like that. He was tickled for you without even having met you. He loved your kids and wished the best for them without knowing them. He thought Kiran might go to his beloved Princeton, and I think he might have forgiven the fact that Kiran unraveled his iPhone sock multiple times, but I’m not sure he would have forgiven the boy for ending up at Harvard. I’m just kidding. Steve Williams would’ve been so proud of him, just like he was so proud of me, even though he never met either one of us and even though I got a bad book review from Carolyn See.